Become Maximus avenging his fallen emperor and his family by entering the ring. Click here to play! You’ll be battling for your life in this fantastic online slot adventure inspired by the popular Gladiator film. As Maximus you’ll need to navigate the reels filled with cunning characters in order to find your success. Keep a close eye on Commodus, the emperor’s son, as this calculating character is the highest paying symbol in this game. He’ll bring in up to 5000 times your line bet. You’ll also want to watch out for Lucilia as she is the emperor’s daughter and coconspirator in his murder. Spin two to five of her symbols across the reels to get a payout worth up to 1000 times your line wager. The reels are also filled with plenty of other characters to aid you in your quest, including your friends Antonius Proximo, Juba, and many more. If you’re successful in your battles, you could find yourself triggering one of two different bonus rounds in this game. The first "The Gladiator Bonus" is triggered by three or more helmets on selected reels. 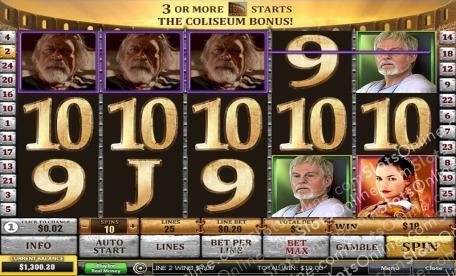 The second "The Coliseum Bonus" is triggered by three or more Coliseums anywhere on the board. The latter is also a scatter symbol that will multiply your total winnings if you can collect two or more. Do you dare enter the ring as Maximus to fight for justice? Find out in this fantastic new online video slot. The infamous Coliseum symbol is a scatter. It will multiply your total bet by up to 100 if you can spin two or more anywhere on the board. It will also trigger a bonus game if you spin three or more across the board. There are two different bonus games in this video slot. The first is the Gladiator bonus. Spin the gladiator helmet anywhere on reels 2, 3, and 4 at the same time and the game will randomly pick nine different helmets (each one worth a bonus amount). All helmets will be added up to equal your bonus payout. The second bonus game is called the Coliseum bonus and is triggered by three or more Coliseum symbols anywhere on the board. During this game, you will be prompted to choose a brick to reveal a prize. This ranges from free spins to multipliers and cash.